Now that you’ve heard these two completely awesome musicians and their versions, you can steel yourself and sample my humble attempt. Before you do, I’d just like to refer your attention to the large graphic in this post. 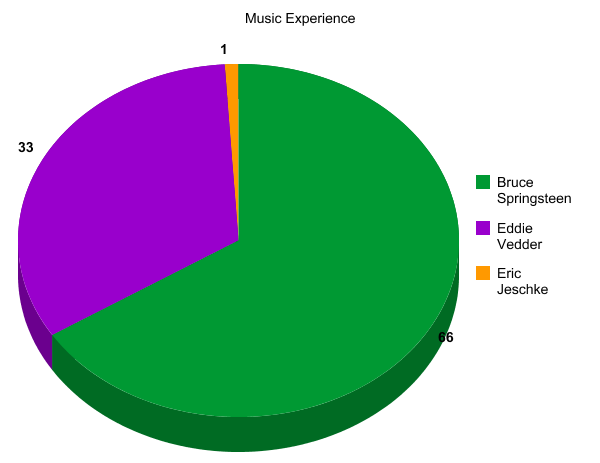 This is a super-scientific graph that shows the amount of relative music experience of the three persons mentioned in this post. Of course, my section would be even smaller if the graphic making software allowed it! So without further ado, please check it out on my posterous: No Surrender, Eric Jeschke version. Andreas, Earl, thank you very much for the kind compliment!